Property Location With a stay at Quality Inn Oak Ridge in Oak Ridge, you&apos;ll be minutes from American Museum of Science and Energy and Oak Ridge Art Center. 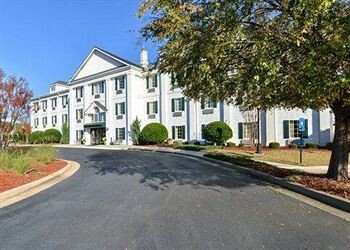 This hotel is within close proximity of Oak Ridge Playhouse and Children&apos;s Museum of Oak Ridge.Rooms Make yourself at home in one of the 79 air-conditioned rooms featuring refrigerators and flat-screen televisions. Your room comes with a pillowtop bed. Complimentary wireless Internet access is available to keep you connected. Conveniences include desks and microwaves, and you can also request cribs/infant beds (complimentary).Rec, Spa, Premium Amenities Don’t miss out on recreational opportunities including a 24-hour fitness center and a seasonal outdoor pool.Dining A complimentary breakfast is included.Business, Other Amenities Featured amenities include a 24-hour business center and complimentary newspapers in the lobby. Planning an event in Oak Ridge? This hotel has facilities measuring 300 square feet (27 square meters), including a meeting room. Free self parking is available onsite.